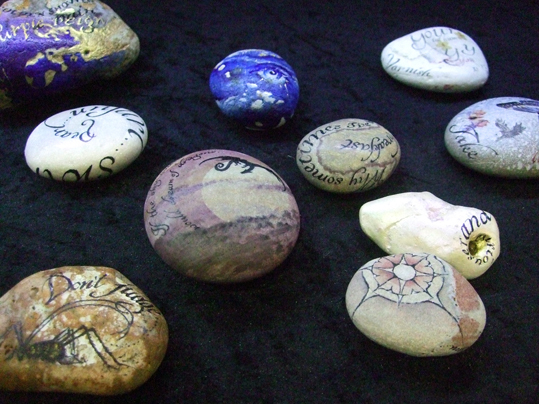 These amazing painted stones were on my favourite stall at the Mind Body Soul Experience, which I went to yesterday. The event is on all this weekend at Alexandra Palace, in north London and the stall where I photographed these stones is 127a, if you want to go and have a look yourself. They are hand-painted by Alexis and each one has a unique message. This is just a small selection - the themes cover love, friendship, travel, nature, the sun and moon and various other things. They are really tactile as well as beautiful and I spent ages turning each one over and examining them before picking one to buy for myself. Alexis also runs workshops where you can learn the techniques involved to create your own soul stone. I'm going to be writing more about the Mind Body Soul Experience later, but I wanted to share this photo first. The event is on today until 5pm at Alexandra Palace, Alexandra Palace Way, London, N22 7AY. Day tickets cost £12 online.